(Venice, Italy) In this rapidly spinning world, it is difficult to maintain a presence when your business has existed for more than a 1,000 years. Really, it gets exhausting, trying to keep up with contemporary trends when your origins began more than a millennium ago! But the gondoliers of Venice are giving it a shot. 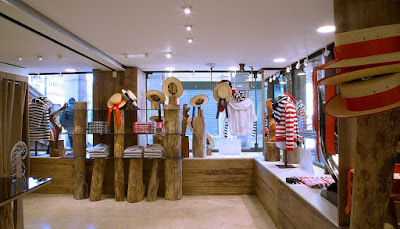 Thanks to Emilio Ceccato, a Venetian clothing brand that has been around since 1902, the gondoliers of Venice now have their own official line of clothing -- which you can buy, too. A percentage of all the proceeds is invested in supporting the ancient gondolier tradition, ensuring that one of Venice's most-beloved symbols remains alive and well. Although Venice's gondoliers have been around for more than 1,000 years, they never before had their own official line of clothing. 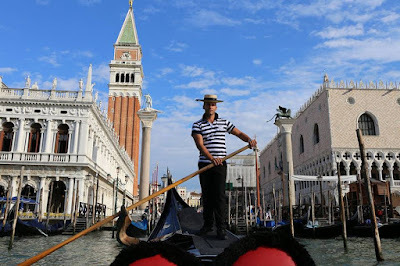 Now, each gondolier will receive one full uniform each year for free from Emilio Ceccato. The logo incorporates the symbols of Venice in one unique design: the winged Lion of San Marco holds an open book, which symbolizes peace. On either side is the ferro, the metal design found on the prow of the gondola that represents the six different sestieri, or districts, of Venice. .
On Thursday, February 25, the Emilio Ceccato Group presented the Gondoliers Association, which represents Venice's 433 gondoliers, with a check for €1,500, a deposit towards the first project they are undertaking together -- they will build two new "Gondolone" to transport people across the Grand Canal. Not only will the Comune of Venice get a couple of much-needed boats, it will also provide work for the squero, the shipyard where one gondola is already under construction. The Gondolone, or barchetta da parada, is broader and flatter than a traditional gondola, so that up to 14 people can ride across the Grand Canal at the same time. The public service is extremely convenient, especially when you simply do not have the time or energy to go all the way to one of Venice's four bridges to cross the Grand Canal. Instead, you hop into the traghetto, and let the gondoliers whisk you across the canal. The boat is steered by two gondoliers, one in the front, and one in the back. Most people ride standing up, but you can perch along the edges if your sea legs are wobbly. "The Gondoliers are the symbol of #Venice -- heroic, able to master the winds, the tides, the tiny canals, and the masses of tourists --all with skill, talent and grace. 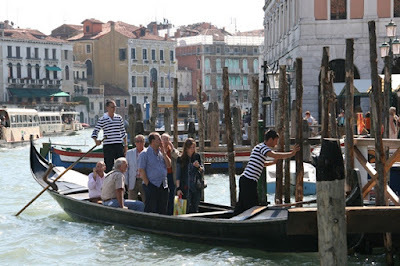 Each Gondolier -- handsome in his striped shirt -- makes each visitor feel that they could have been part of the magnificent Venetian past which brought treasures from across the globe on fast ships, created a culture which stood up to Rome, and made science and art its mark. Now the Gondoliers Association will continue to contribute to the city of Venice through this first of its kind bond with the Emilio Ceccato group. These special Venetians will help their magical city not only through their trade but by directing the brand royalties toward projects which safeguard their trade and those artisan trades which surround the gondola and the Venetian rowing style, traditions which keep Venice vibrant." I support the Associazione Gondolieri of Venezia. During the awards ceremony of the US Gondola Nationals, I had the opportunity to tell all fifty competitors about your association. In addition, I presented an Associazione Gondolieri patch to the owner or representative of each of the twelve gondola companies participating. Thank you for producing high quality clothing for gondoliers – all my staff in Newport Beach and Texas wear Emilio Ceccato striped shirts. The Emilio Ceccato shop is located at the foot of the Rialto Bridge on the San Polo side, and has been completely restored, with original brick and piles. There is even a column inside that seems to be holding up the Rialto Bridge(!) They sell official, high-quality gondolier-wear -- T-shirts, sweatshirts, the famous straw hats, wool caps, baseball caps, winter vests, sweaters, pants and more, and the royalties from each item will be invested in projects that safeguard the gondoliers, as well all the artisan trades that that support the gondola and Venetian rowing, like the people who make the oars, the ferro, and the forcola, or oarlock, as well as investing in apprenticeship programs. If you can't make it to Venice, you can always shop online at Emilio Ceccato. Not only will you have your own unique piece of Venice, you will be helping to keep one of Venice's oldest traditions alive.